Now in its fifth year, the CCCC Undergraduate Research Poster Session gives students an opportunity to conduct and present their research.This year Eli Review is proud to support this effort by providing a free course for the peer review process. 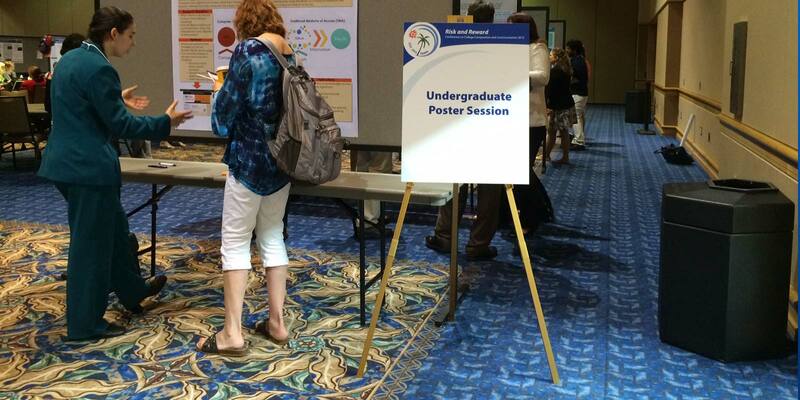 To learn more, we interviewed Jessie Moore, coordinator of this year’s poster session. [f]rom January through March, the organizing team supports the students in the development of their posters by sharing resources and facilitating a peer review process prior to the CCCC convention. How has the planning team been working with the undergraduate researchers so far? Jessie Moore: The planning team invites proposals for the poster session, and during the review process, we work in pairs (a faculty member, plus a graduate student/TA or undergraduate student) to offer feedback on the proposals. Regardless of whether we accept the proposal, ask the undergraduate researcher(s) to revise and resubmit, or reject the proposal, we want the student to have formative feedback that will guide not only their poster design, but also their research plan if their research is still in process. Although the normal CCCC review process does not include a revise and resubmit option, our goal is to extend the mentoring network for these undergraduate researchers who are entering our field. Offering an opportunity to revise and resubmit – which more students took advantage of this year than in any prior year – allows us to share additional guidance on conducting research in the field and on disciplinary conventions for sharing that research with others. In the months leading up to CCCC, we share strategies for designing posters, offering tips both for selecting content to include (and content to omit) and for effective visual design. When Joyce Carter added posters to the CCCC program, last year, she integrated many of our tips into her guidelines for poster presenters. We now direct the undergraduate researchers to the official CCCC guidelines when we share our strategies. You are coordinating 17 undergraduate presenters (presenting 15 posters) and 7 members of the planning team (3 faculty, 3 graduate students/TAs, and 1 undergraduate student) from far flung institutions as they prepare posters and talks. Why add Eli Review to the mix? Jessie: We encourage presenters to share a draft of their poster 4 weeks before CCCC so that the planning team can offer feedback while students still have time to revise. In the past, that round of feedback has required emailing drafts and manually tracking whose draft we’d seen and who had received comments. 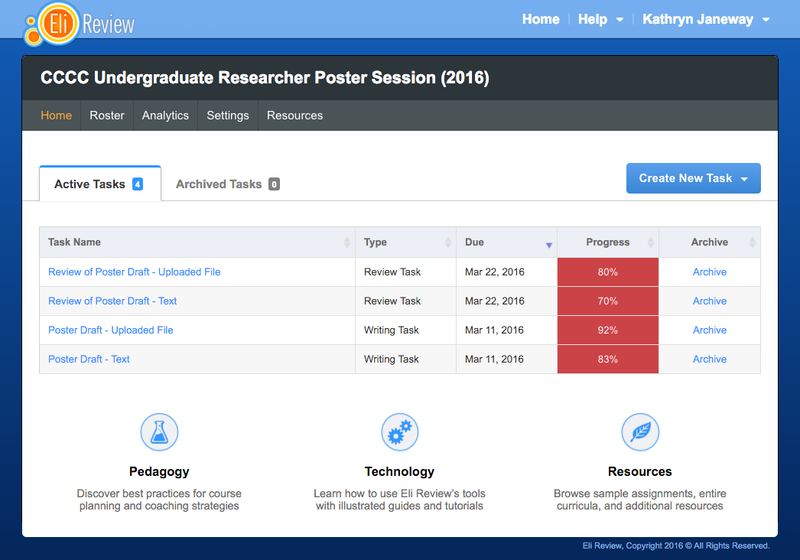 Eli Review simplifies the process and makes it easy for us to see where the undergraduate presenters are in the drafting and feedback process. More significantly, Eli allowed us to add peer feedback to the process. The students receive an extra set of feedback that we weren’t able to coordinate well earlier, and they see a preview of how their peers are designing their posters. That preview enables them to adapt their peers’ effective strategies for their own posters as they continue to revise their content/design. The planning team now “endorses” peer comments, and we continue to email our comments if we want to add additional feedback. Next year, we’ll experiment with adding a revision plan so that we can leave feedback for the students in Eli Review. From this year’s pilot of using Eli, we’ve learned that we need to shift our timeline so that we allow more time for the review process. When the planning team is the only group giving feedback, we can anticipate a quick turnaround time, but when we invite participants – from multiple institutions with varied term calendars – to give peer feedback, we need to build in more time for the feedback process. While we are still learning how to streamline our use of Eli Review in this out-of-class context, we believe Eli is a great addition to our poster session mentoring process. Eli continues to emphasize the write → review → revise → write → review → revise process we promote throughout the poster proposal → poster draft → poster session sequence, and it adds rich opportunities for peer learning. We are immensely grateful to the Eli team for supporting the work of our presenters. The Eli Review team is thrilled to be able to support the coaching efforts of the planning team. We can’t wait to see the final posters at the CCCC Undergraduate Research Poster Session, immediately following the opening general session, on Thursday, April 7, from 10:30-11:45. Peer Learning Prep for #4C16 UR Poster Session was published to the Eli Review Blog in the categories Pedagogy, Presentations, Professional Development, Scholarship.